Arthur Meehan lived and dreamed the development of a cattle station in the Murchison area of Western Australia. His wife Kit Murphy tried to support him and build a family in the Outback of the North West. This is their life as seen by one of their five daughters – a story of love and tragedy, success and misfortune, light-hearted fun and total misery, the good and the bad of the rural heart of Australia. 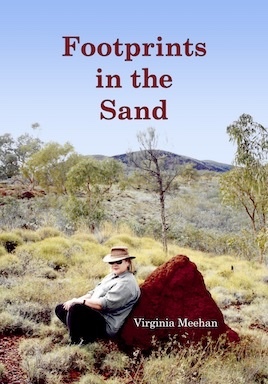 Virginia Meehan has a vivid recall of her childhood years, first on Mt Vernon station in the Murchison and then on Hillside Station in the Pilbara when circumstances forced the family to start again. Her memories include living through the radioactive fallout of the Monte Bello atomic tests, the effects of ‘the alone’ on the mental health of outback people and the tragedies when all they could do was not enough. Footprints in the Sand is printed through the Lulu print-on-demand service. Follow one of the links below to purchase it. Prices quoted are in Australian Dollars as of 10th September 2017. If you want to know more about the book, contact Virginia Meehan (Virginia@cowirrie.com). If you are having difficulties purchasing the book, contact Michael Horton (Michael@cowirrie.com).